I didn't expect to find myself back at Providence anytime soon but the meal was my prize for a bet made three years ago and it was long past time to collect. 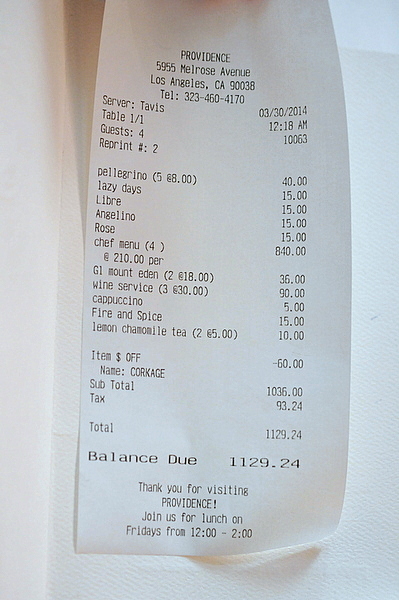 Naturally nothing less than the 16-course Chef's menu would do and we were fortunate enough to snag the chefs table. 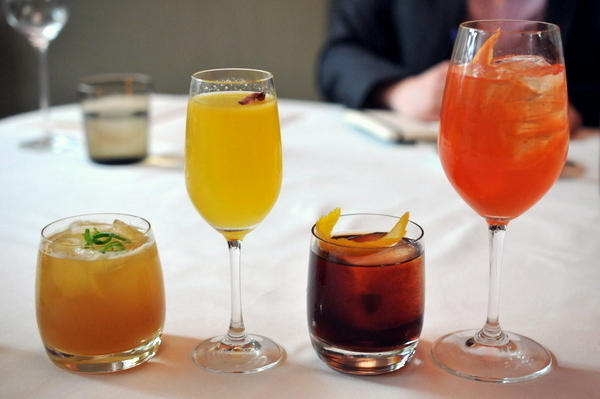 I was a bit curious how the cocktails would hold up as longtime bartender Zahra Bates left for Cole's Red Car Bar after five years at Providence. My favorite of our quartet was the Angry Angelino, almost petrol flavored, the cocktail has a bitter herbaceous bite from the jalepeno softened with the spice from the ginger. Bursting with fresh lively passion fruit and a sweet effervescence, the Love is a Rose would have made a wonderful summer sipper. 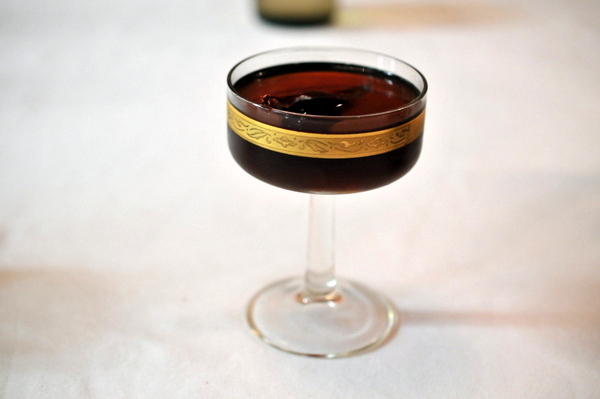 The Libre exuded a woody herbal heft shaded with the slightest hint of chocolate and orange. The Lazy Days was another light fresh cocktail that gives off pure mandarin notes with a touch of bitterness thanks to the Aperol. 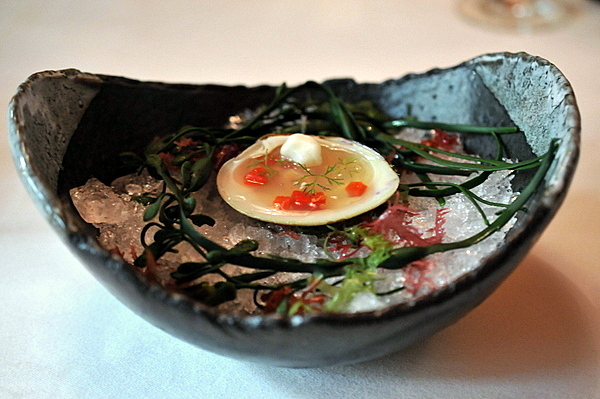 Providence typically starts the meal with a modernist twist on a cocktail. I found the dark and stormy to be an upgrade from their former signature greyhound spherification. 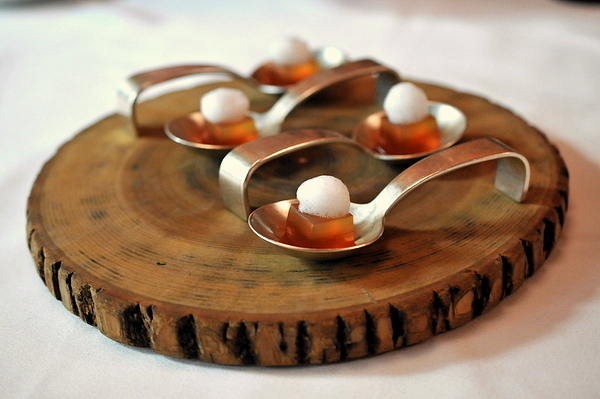 The ginger foam has a touch of prickly heat to compliment the pleasing candied sweetness of the rum jelly. Think of this as a sushi taco. 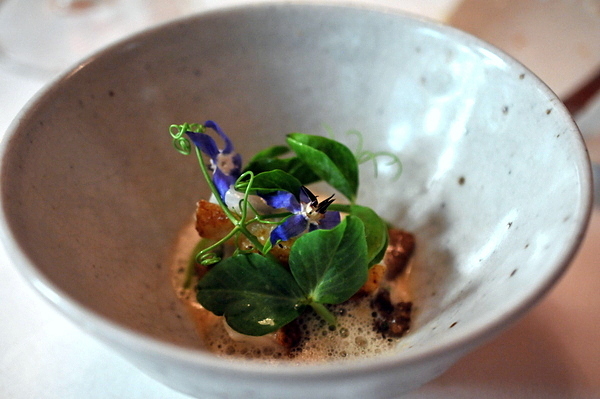 The delicate nasturtium is filled with a mix of cured scallop tartare, puffed rice, and sushi rice. The creamy sweetness of the scallop is readily apparent upon mastication while the "taco shell" brings a subtle twinge of herbaceous savor. 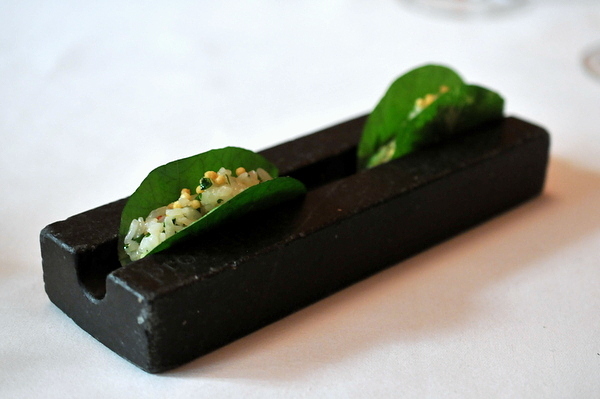 Our third amuse came in a rather elaborate presentation wrapped in seaweed and served on a bed of ice. 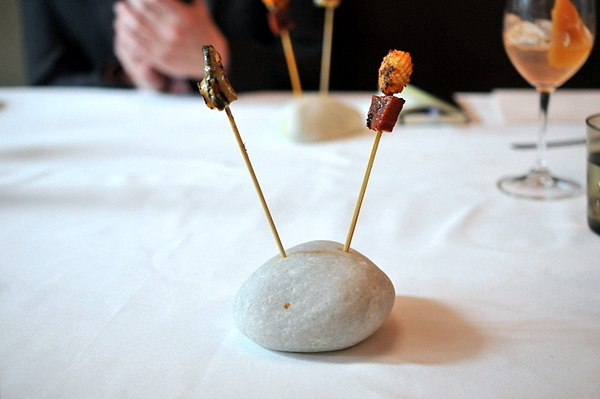 The dish is initially dominated by the smoky sour twang of the chorizo, but a thread of dark of dark earthy salinity makes itself felt on the back end of the bite. Rather than go with the typical pairing, my companions and I decided to bring a few bottles we'd been saving for a special occasion. 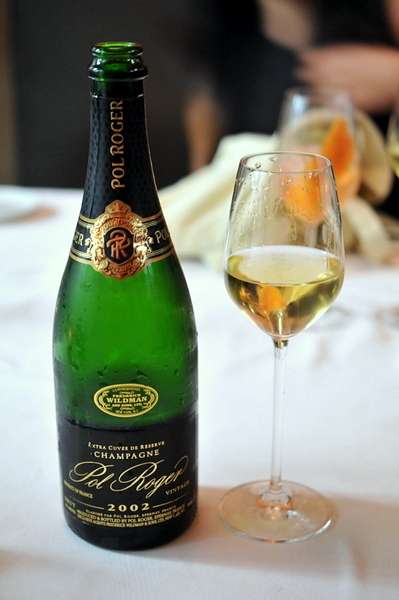 First up was a 2002 Pol Roger, the wine shows off yeasty toasty notes that are almost Krug-like in their intensity though as the wine warms I detected a bit more minerality and citrus. 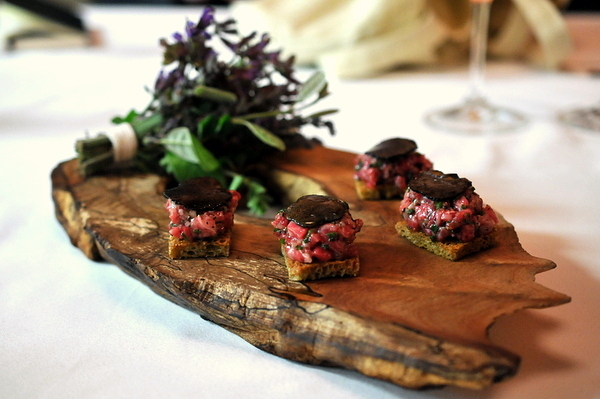 The Wagyu tartare was every bit as decadent as I expected it to be, fatty and supple, with a hint of luxuriously earthy truffle. The grilled foccacia had a crisp and toasty texture and slight bitterness, a lovely counterpoint to the beef. This next snack was a lovely study in contrasts. 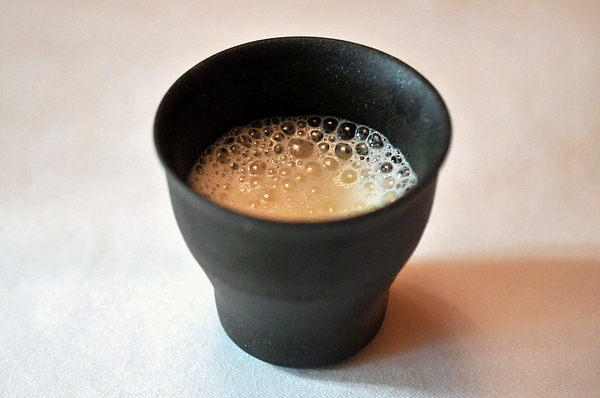 The broth was made from slightly smoked halibut bones giving it a thick creamy mouth feel and buttery saline umami reminiscent of Chinese gao tong. By comparison the peas brought a sweet bright levity all wrapped up with a taut snappy texture. I typically prefer my oysters raw but a perfectly cooked one has its own charms. The Shigoku was noticably softer with a slicker mouth feel. The flavor is initially dominated by the caviar but there is a persistent melon-y sweetness that lingers on the finish. The skewers remain unchanged from my previous visit. The abalone is definitely the more subdued of the duo, coupling a deep ocean-y savor with a hint of sweetness. The squid and chorizo exudes a powerful savory twang while the squid acts more as a textural element, snappy and dense but fairly mild. Cimarusti and company really went all out with the snacks, serving up 9 consistently delicious snacks to start the meal. The last treat was definitely on the heavy side with a rich savory mixture of beef and vegetables reminiscent of a beef stew all wrapped in a crisp delicate shell of feuille de brick. Conceptually, this course remains largely unchanged from my previous visit, but I thought the execution was a bit more on point this time. The key here was the use of pickling brine as a sauce for the fish, the added acidity brought out the tangy flavor of the vegetables putting them on equal footing with the oily heft of the mackerel. Our second wine was a real eye-opener for me. 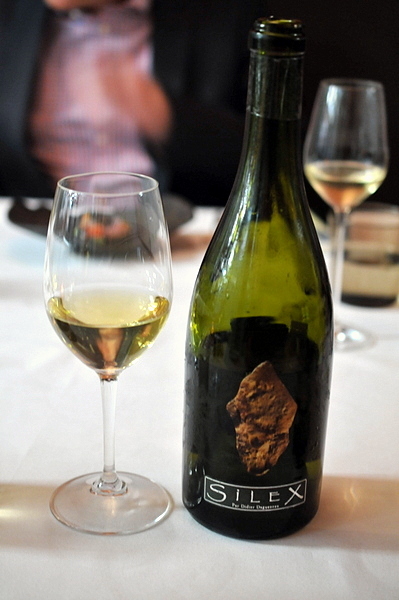 Never a fan of Sauvignon Blanc, the Silex showed all the ripe honeyed tropical notes the varietal is known for, but with a chalky minerality that kept the wine fresh rather than heavy or cloying. 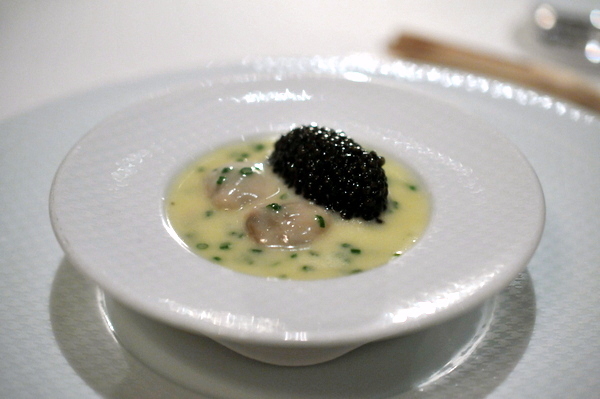 Our second course was a seafood-infused riff on the classic eggs and truffle. The creamy scrambled eggs form a gentle savory base for the luxurious seafood while the mixture of cooked and puffed buckwheat gives the dish some body and textural variation. This was a more composed spot prawn dish than I'm used to seeing from Cimarusti. 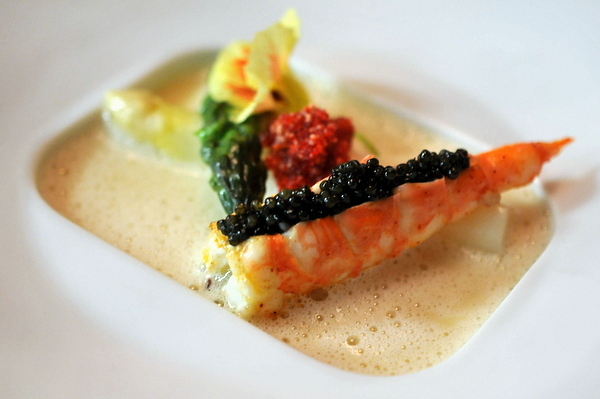 The prawn itself exudes a pristine sweetness augmented by the intense salinity of the caviar. The tender asparagus shoots have offer a lateral vegetal sweetness while the jurancon sauce is simultaneously sweet, buttery, and tart. 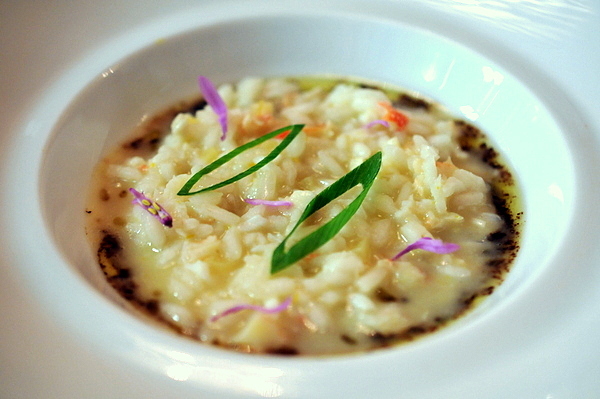 The risotto was probably the weakest course of the night for me. 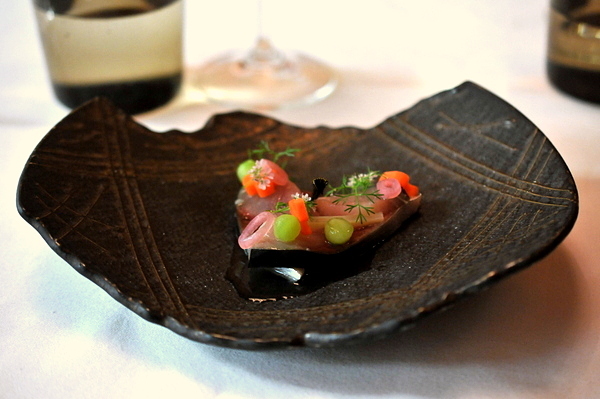 I was expecting a delicate course highlighted by the king crab but any shellfish flavor was overwhelmed by the earthy ponderousness of the black bean. The citrus does provide some relief but I found the combination with the black bean a bit jarring. The meal got right back on track after that little hiccup with the risotto. The salmon belly came out the perfect temperature with a deep red center. Unsurprisingly the fish was tender and brimming with oily goodness. 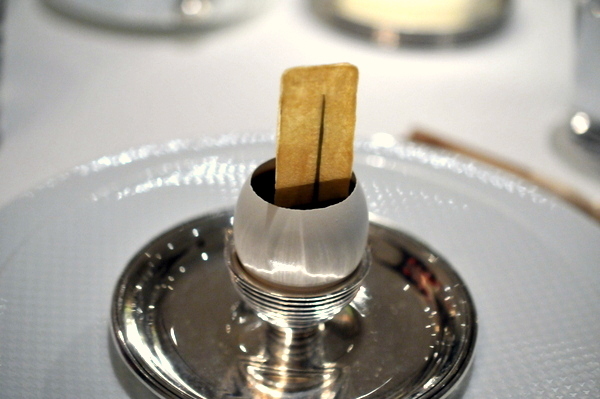 The accompanying sides were a multifaceted blend of sweet salsify, tender creamy leeks and sharp tangy shimeji mushrooms all wrapped up with the subtle earthy musk of black truffle. 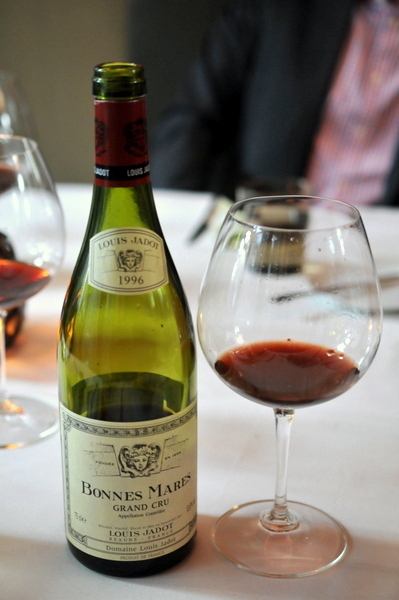 Our final wine of the night was a delicious 1996 Bonnes Mares from Jadot. The wine has plenty of both bright cherry and molasses and cola-like sweetness on the nose. Hints of underbrush and earth keeps things balanced making for a complex vibrant and thoroughly enjoyable wine. 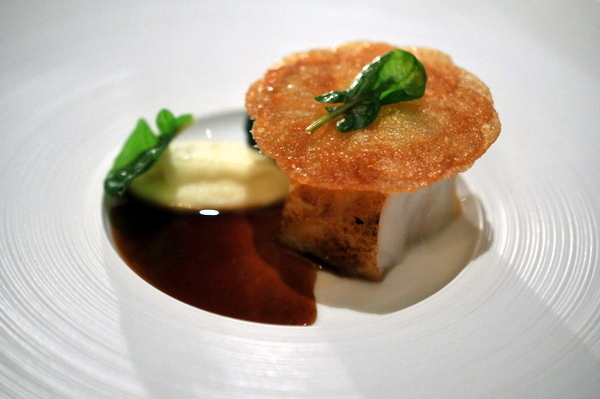 Moving onto the heaviest dishes of the night we started off with a wonderfully cooked Turbot. The meat showed off the characteristic density I was expecting along with a bit of extra fatty relish. 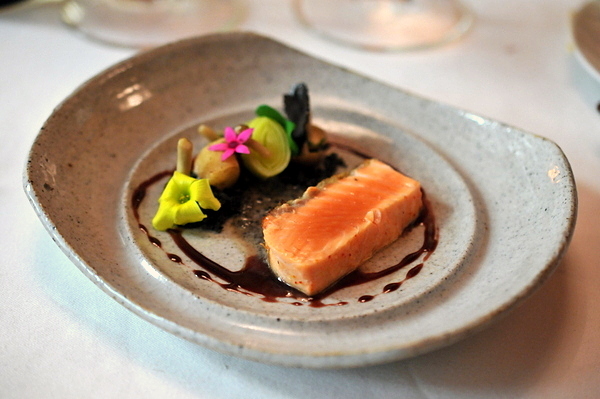 The clean salinity of the fish works well as a baseline for the fresh herbaceousness of the succulent greens as well as the deep forested flavor of the morels. 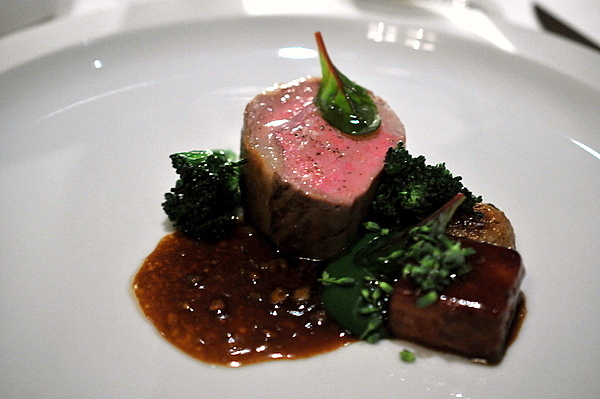 A very straightforward but beautifully executed and immensely enjoyable dish. 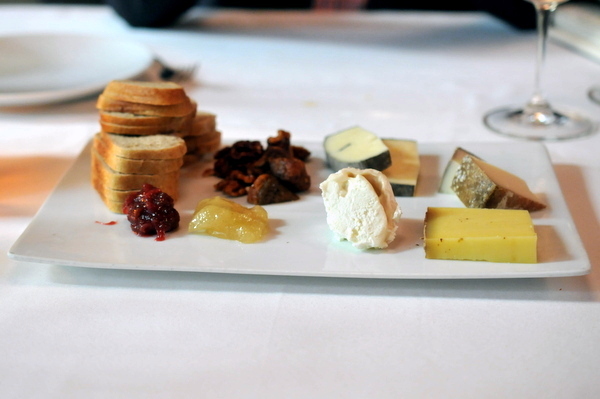 We were a bit lazy about getting down all the cheeses but the quartet was fairly safe across the board, my favorite ended up being the truffle cheese which I believe our server called Sottocenere. Moving onto desserts we started with a fun palate cleanser of fruit and yogurt. The flavors are an intense gamut ranging from tart to sweet all held together by the malolactic tang of the yogurt. Our second dessert was a cheesecake done with an Asian riff. 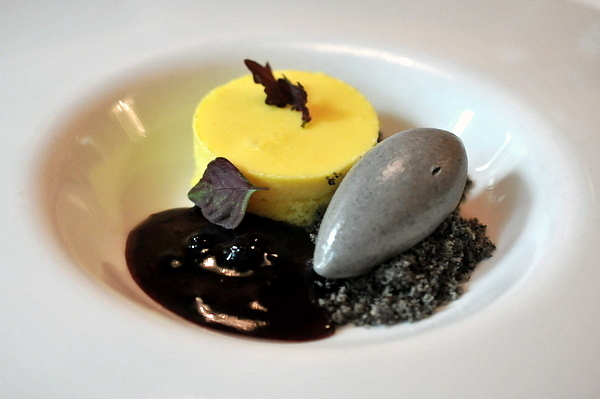 The black sesame gives the dessert a flavor reminiscent of tong yuan while lemon curd brings a sharp countervailing acidity. Our second main dessert was a cremeaux made from Valrhona Dulcey chocolate. The blond chocolate is definitely on the lighter side with more caramel and buttery notes than the typical chocolate. The spiced cake added a nice weighty warmth to the treat while the sunchoke chips brought just the right amount of intrigue and savor to the dish. Our final composed dessert was a more traditional chocolate dessert built around a seductive base of dark chocolate cake though the flavor of milk and white chocolate each make their unique presence felt as well. 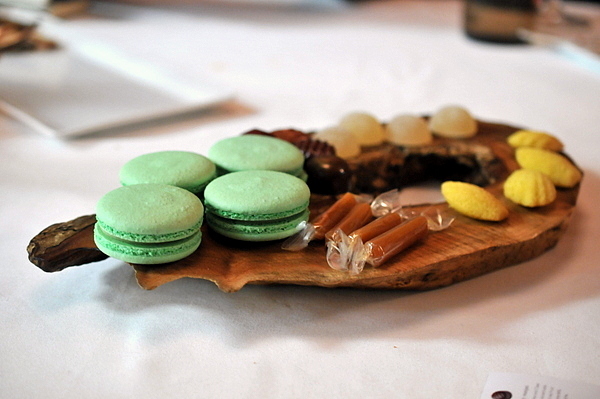 The meal ended with a beautiful presentation of candies and small pastries. While all the mignardises were quite tasty, the caramel was the most interesting of the candies thanks to the savory twist of sunchoke. 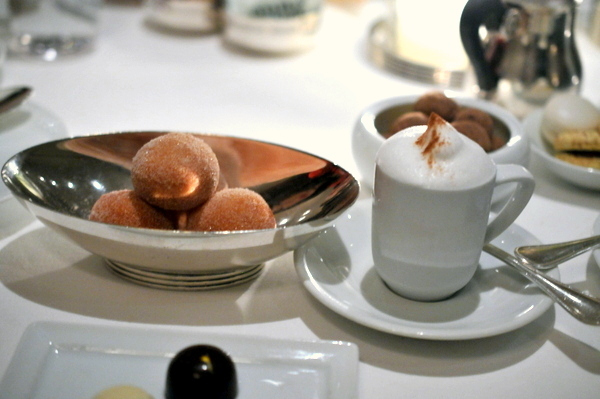 I decided to end the meal with a cup of cappuccino but one of my companions needed something a bit stronger. The fire and spice does show hints of its namesake heat but there is also a strong citrus undertone and hint of sweetness making this a well suited as an after dinner tipple. I didn't think Cimarusti could outdo last year's meal at Providence, but so far each successive trip to Providence has been stronger than the one before. Perhaps like the Biblical Sampson, Cimarusti draws strength from his hair though in this case its the magnificent beard hes been growing for the past year. 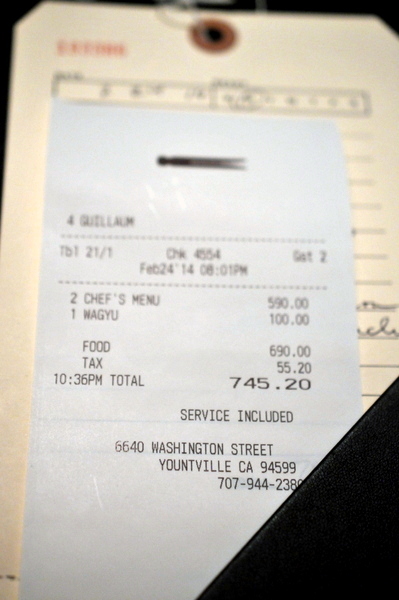 After my previous meal at The French Laundry didn't quite live up to expectations, we decided to forgo the restaurant during our Bay Area trip last summer. Still when one of my friends came up with an extra seat I was hard pressed to say no, besides it was a chance to see what the new Chef de Cuisine David Breeden could do. Breeden, who replaced Tim Hollingsworth back in November of 2012, has spent the better part of his career working for Keller at either The French Laundry (2005-2007, 2013-Present) or Per Se (2007-2012). Born and raised in Tennessee, I was curious if Breeden would bring touches of Southern flair to Laundry's menu. 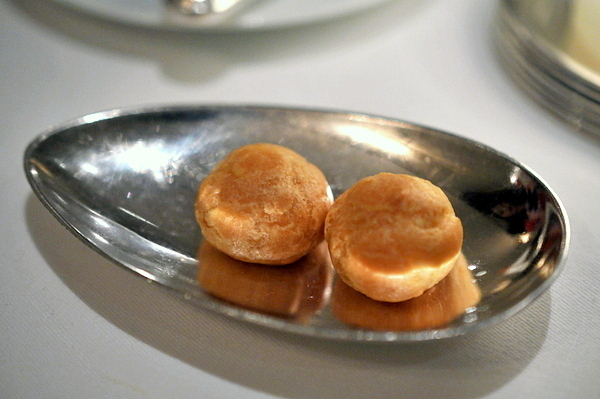 Classic French cheese puffs, inside the fluffy choux pastry is a warm velvety cheese sauce; a tart and savory treat meant to whet the palate for the meal to come. 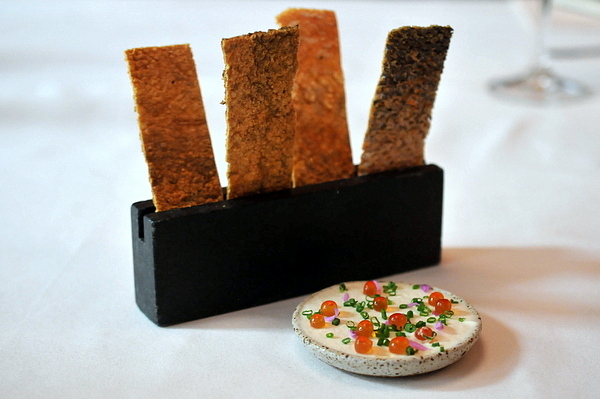 Like the Gougeres, the Salmon Tartare Coronet is a fixture on the French Laundry's menu. I thought the creme fraiche was a bit heavy handed, but the mixture of salmon and the cone was smoky, zesty, and sweet. 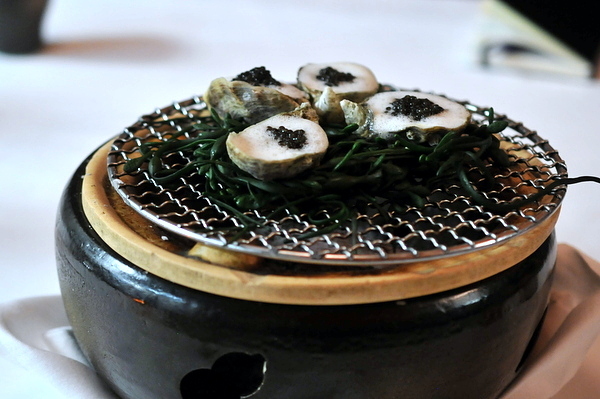 Moving on to the meal proper, we were treated to a classic rendition of Keller's signature "Oysters and Pearls" The dish marries two beautifully trimmed Island Creek Oysters "pearls" with a quinelle of caviar. 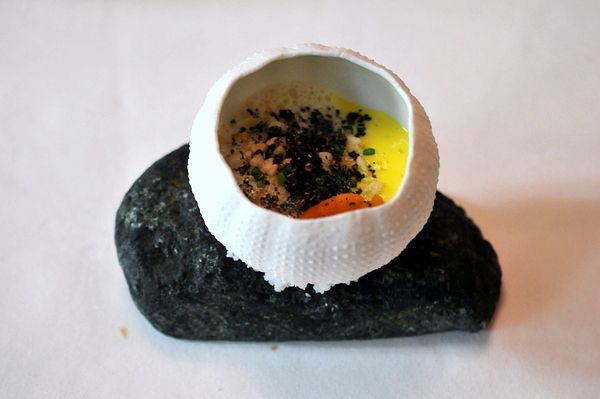 The combination rests in a thick custard of tapioca and stock made from the oyster trimmings. 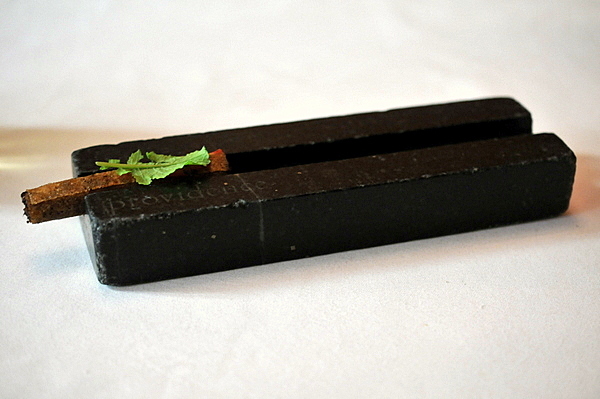 The resulting dish has a multifaceted salinity with a sharp piquant tang and a hint of fresh levity from the chives. The next course was a gift from the kitchen. I was absolutely captivated by this course during my very first visit back in 2007 and am always pleased to see it on the menu, though it doesn't quite impress the way it used to. 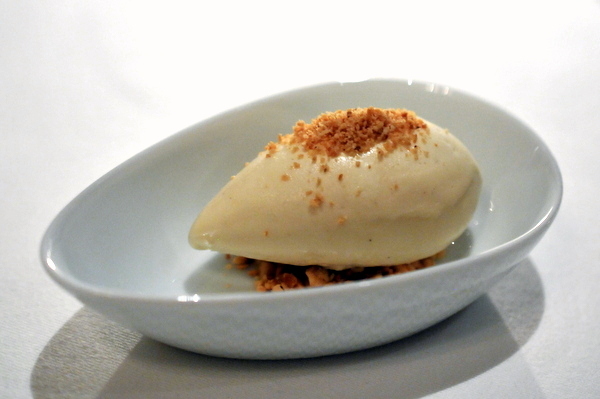 At the core of the dish is a silky egg custard laced with white truffle. The custard is then submerged in a dark gravy of veal and black truffle which giving the dish a dense meaty weight. 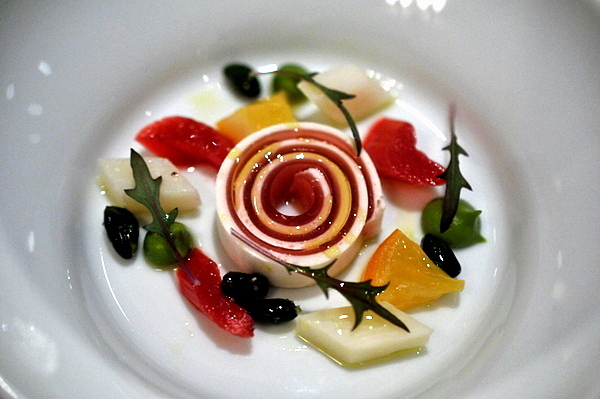 The salad was an excellent follow-on to the weighty truffle custard, the tender hearts of palm are brightened with touches candied citrus and tangy rhubarb coupled with the weighty oily verdance of the pistachio. I would have liked to see a bit more textural variation as the salad was on the soft side. 03: "SELLE DE LOTTE RÔTIE, ENTIÈRE" - La Ratte Potato Purée, Wilted Arrowleaf Spinach, "Pommes Maxim's" and "Sauce Bordelaise"
The monkfish was easily the best course of the night. Composed of protein, vegetables, and starch the dish was probably the most conventional dish but the combination of flavor and texture was spot-on. The monkfish was dense but still pliant with a heady savor augmented by the slight tang and richness of the red wine sauce. The potato purée was probably laden with butter but tasted all the better for it while the Maxims had a rich chip like savor and crunch to them. Finally the spinach adds the right touch of bitter restraint to moderate the richer flavors on the plate. 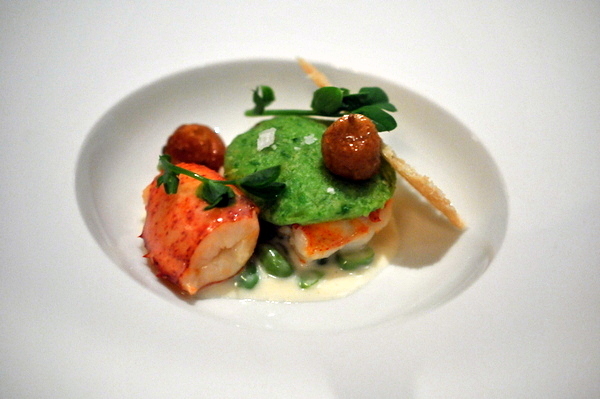 The French Laundry's lobster dishes have always been among their standouts and I was expecting this to be no different. This preparation delivers in terms of flavor, particularly with the interaction between the verdant peas, rich Parmesan cream, and the sweet crustacean; however the dish falls flat texturally. In the past, the poached lobster tails have consistently displayed the most exquisite supple texture but this time around the meat was stringy and tough. 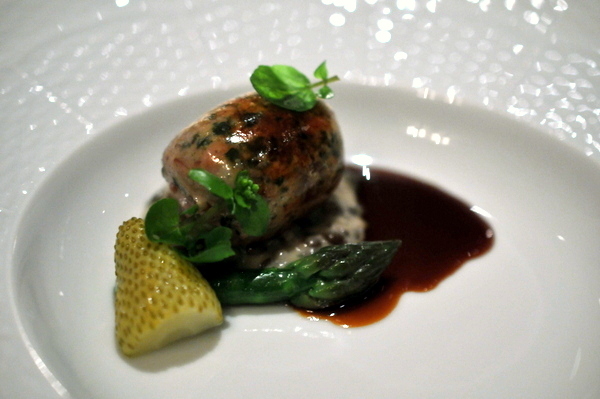 05: WOLFE RANCH WHITE QUAIL "SAUCISSON" - French Green Lentils, Sacramento Delta Asparagus, Preserved Green Strawberries, Watercress and "Sauce Soubise"
A traditional Saucisson is a cured dry sausage typically made with pork and blended with spices. Laundry's preparation is a fresh version that substitutes quail for pork. The resulting sausage conveys a generic meatiness and peppery zest that goes nicely with the tender asparagus shoots and the tartness of the strawberries. Certainly tasty, but I would have preferred the quail served in a less adulterated form, something that kept the characteristic flavor and texture of the bird intact. 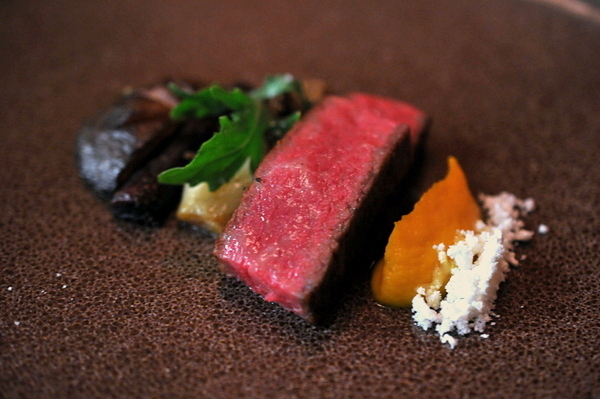 The lamb consisted of beautifully dressed and grilled rib-eye and a small cube of something braised, rich, and delicious. While I thought both lamb pieces of lamb were impeccably prepared, the overall feel of the dish is a bit dense and monolithic. 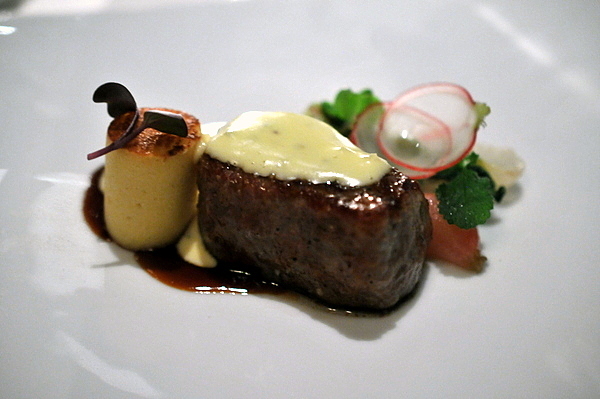 06b: CHARCOAL-GRILLED JAPANESE WAGYU - "Ris de Veau," Bone Marrow "Pain Perdu," Hearts of Romaine Lettuce, Garden Radishes and "Béarnaise Mousseline"
I decided to substitute the Japanese Wagyu for the lamb ($100 supplement) and it turned out to be a great choice. The meat exhibited all a fatty richness preceded by a heady sense of woodsmoke from the charcoal. The Bone Marrow French Toast sounded interesting but with a flavor like savory pound cake it was subsumed by the weightiness of the beef. The succulent romaine and fresh radish slivers provided some relief but nothing near enough to counter the weight of the beef especially with the sheer overkill of the Béarnaise sauce. 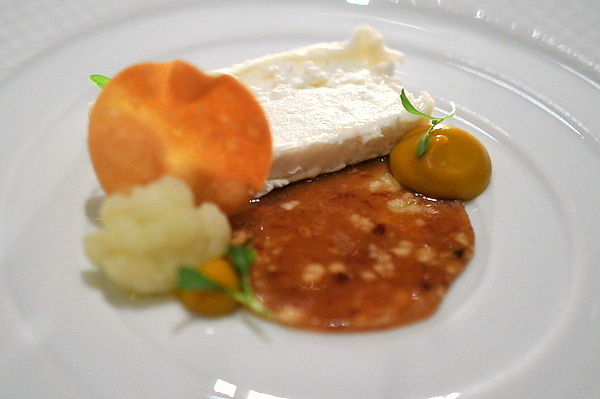 The cheese course is a sheep's milk variety from Soyung Scanlan's Andante Dairy. The cheese feels like a thick paste that melts on the tongue leaving lactic tang and grassy sweetness. The rich jammy Medjool dates play well here as do the subtle curry flavors were an enjoyable if unconventional pairing for a cheese course. We started off the desserts with a relatively light treat. 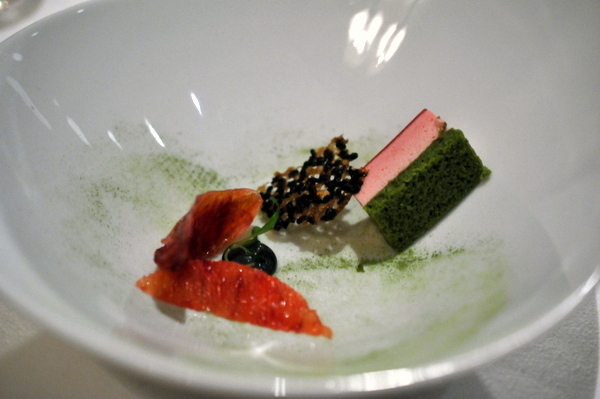 The bitter tang of the blood oranges was readily apparent as was the undertone of herbal flourish from the green tea. 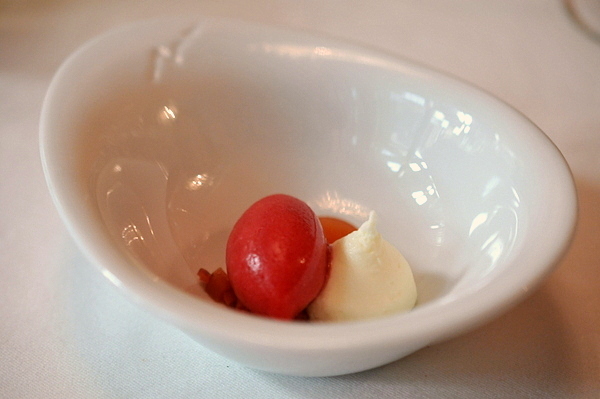 I absolutely loved this dessert cool sweet with a flavor reminiscent of a frozen butter cookie its felt a little simplistic but hard to argue with the flavor. Our third dessert was the richest of the night, a sinfully smooth chocolate mousse and equally rich cake topped with bright green bits of pistachio. 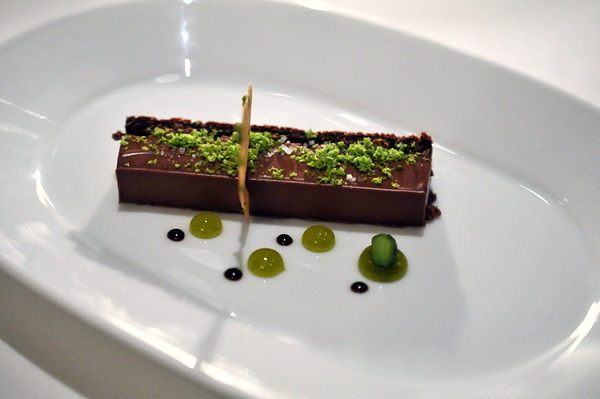 This dessert doesn't pull any punches delivering a decadent chocolate flavor with a slight twinge of green nuttiness. 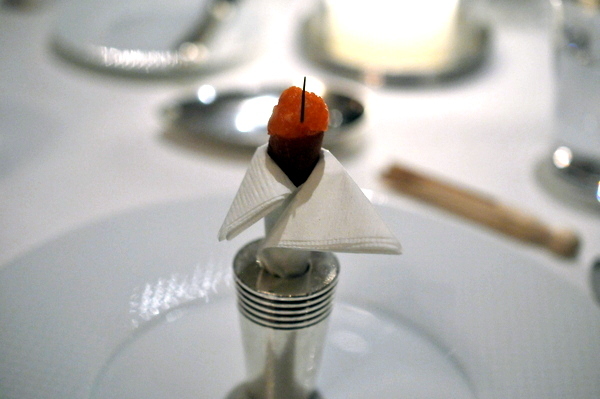 I'm never sure whether this represents the final dessert of the first of the mignardises but regardless its a consistent crowdpleaser. 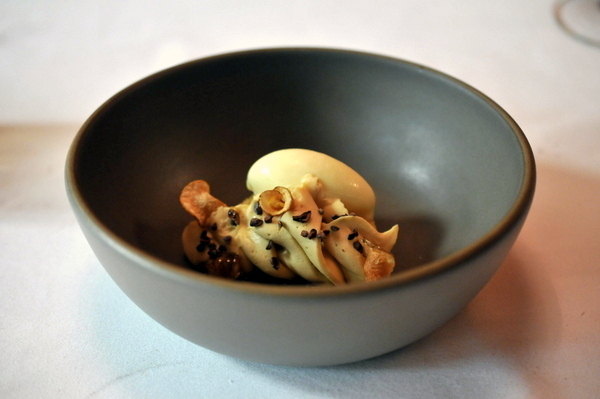 In the demitasse cup is a thick espresso ice cream cool and brimming with coffee notes. The sugared doughnut holes are the perfect foil, warm and fluffy with a hint of sweetness, now if only my local doughnut shop offered coffee and donuts like this every morning. 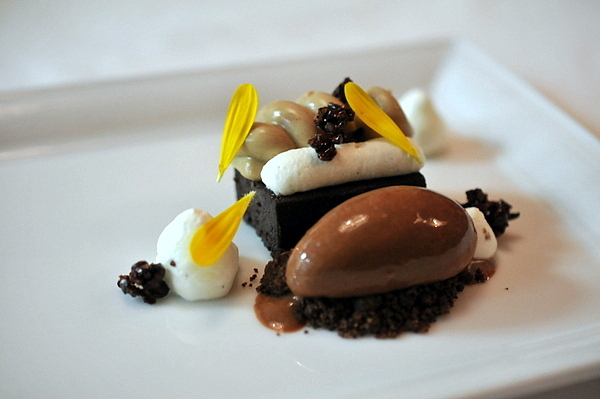 Dinner at The French Laundry always ends with a veritable onslaught of desserts. 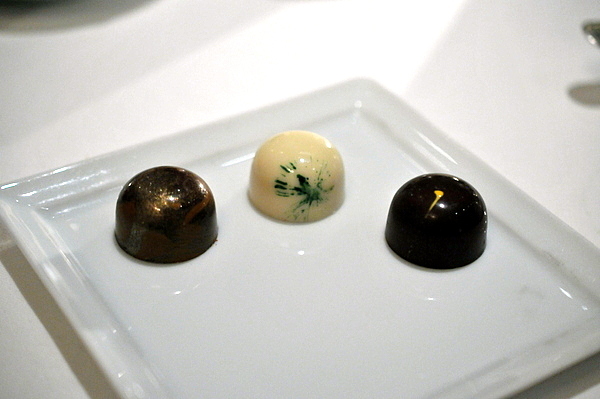 I typically make a point to try all the house made truffles but having tasted most of them before I went with my three favorites: White Chocolate Yuzu, Passion Fruit, and Salted Caramel. 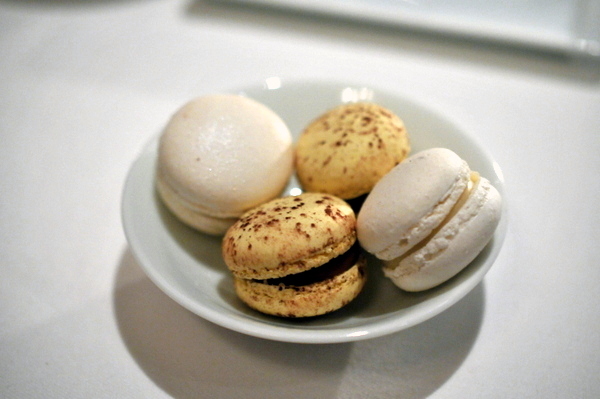 These were textbook Macrons, featuring a delicate crumbly meringue shell and a rich creamy filling. Sadly in the rush of desserts I forgot to record the flavors. 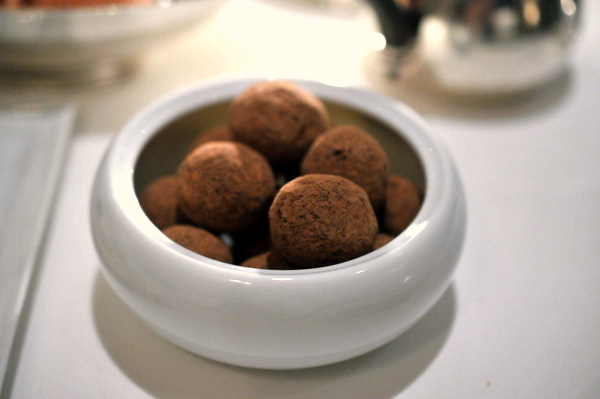 The final treat of the night was a bowl of chocolate and caramel covered macadamia nuts. These aren't your typical store bought confections. The sensation of biting the thin brittle shell is an absolute joy as is the subsequent flavor, a multifaceted blend of sweet and nutty with a hint of toasty savor. Unfortunately I'd have to say this meal was relatively on par with the last one. Again the technique and flavors were largely there but the meal felt overly heavy this time around with less bitter or tart elements for balance. Perhaps I'm just out of tune with what the chefs at Laundry are trying to accomplish or after five visits I've become a bit jaded. Despite my recent experiences, I would still suggest those who haven't been make a trip and decide for themselves.